My name is Ally, and I have type 1 diabetes. When my mom told me she had signed me up for a week long diabetes camp, I was not happy. Seven days with people I didn’t know, in an unfamiliar place, without my phone was not how I wanted to spend a week of summer. I don’t think any 16 year old girl would be thrilled with the idea. Before attending Camp Midicha, I was struggling with my diagnosis and going to camp was forcing me to acknowledge it. I cried the entire drive there and for an hour after my mom dropped me off. I was so nervous to be away. On the first day of camp, one of my counselors went around in a circle and asked every camper to share what they felt was the best thing about having diabetes. I didn’t have an answer. Most of the girls had diabetes for most of their lives, but I had only been diagnosed for 6 months. They all talked about the personal growth they experienced, the friends they’d met, and the awareness they have created around type 1 diabetes. I was still coping with the shock of diagnosis and learning what disease management required, and I didn’t see one positive thing about it. 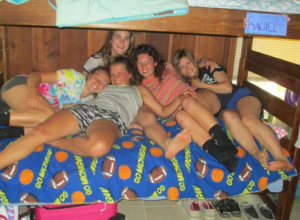 As the week went on, I made friends with three girls in my cabin. They shared insider tips on diabetes, showed me the ins-and-outs of camp and most importantly loved me for who I am. The four of us are all facing difficulties that most teenagers do not have to deal with. They have become the closest friends I have ever had. We created an unbreakable bond, one that is difficult to put into words. I am so grateful for my other friends and family for their commitment to understanding my disease and all of the details, but there is something different about being with people just like me, who live this disease EVERY.DAY. At the end of camp we repeated the activity from the beginning. 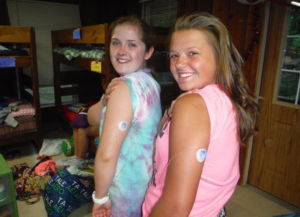 “What’s the best thing about having diabetes?” When it was my turn, I looked at my new friends and smiled as I explained to the rest of the group that my camp experience was the best thing about my diabetes. 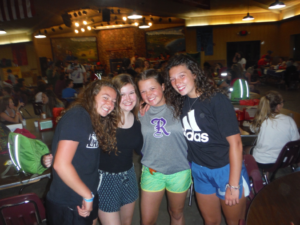 The friendships I made at camp are ones that will never be broken, and I am extremely thankful for the opportunity to have experienced Camp Midicha. I never thought I would feel so blessed by such an awful disease, but my girls give me a reason to be.